For services to the Sealed in delivering the major muster at Blenheim Palace in 2013, Hammond's have been awarded a Silver Essex Medal in recognition of their significant contribution. The medal was received from Lord General Paul Eaglestone, and will adorn our regimental drinking horn - shared equally by all members of Hammond's Regiment. Hammond's Regiment have received many plaudits and honours, but 2012 has been a bumper year! We are extremely proud of our connections with the Imperial City of Memmingen in Bavaria, and this year Dr Ivo Holzinger, Oberburgermeister presented Hammond's Regiment with two medals. Click on the images below to learn more about each medal. On stepping down as Commanding Officer of Colonel Robert Hammond's Regiment of Foote and 2iC of the Cittie of London Brigade in 2009, Kevin was presented by the regiment with a new set of Bandoliers and a Tower Pattern long barrel matchlock musket made my our late member and master craftsman Steve Harrison. Awarded by The Lord Generall of the Armie of Parliament to Kevin Hawgood - for Dedication, and his long service as Commanding Officer of Hammond's and 2iC of Cittie Brigade. 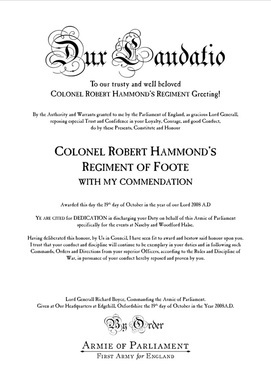 Awarded by Richard Boyce, The Lord General of the Armie of Parliament to Kevin Hawgood - for Dedication, and his long service as Commanding Officer of Hammond's and 2iC of Cittie Brigade. Hammond's Regiment are immensely proud to have received a Battle Honour for their part of the fine performance given by the Cittie of London Brigade over both days of the weekend at Shugborough, in 2007. 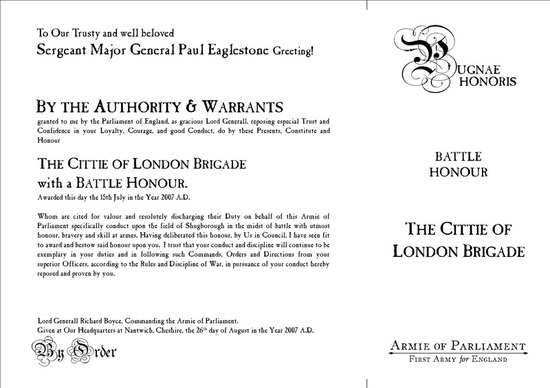 Battle Honours are rarely given out and its award is prestigious for all of the regiments involved. Awarded by Robin Stinson, The Lord General of the Armie of Parliament to Gary Tipping - who was the first recipient of this award for service as Lt Colonel and 2iC of Hammond's Regiment. Hammond's Record your Medals / Awards Here.